You’ll be familiar with most animals one finds in a zoo، from the lizards to the birds، but have you ever seen one X-rayed before? If not، Oregon Zoo was here to help with a Twitter thread comprised of X-rays taken during health checks at their veterinary centre، Press Association reported. The photos prompted much chin-stroking from the viewing public، so here they are in all their glory. Just take a look at that tail – a perfect spiral. How about a Rodrigues flying fox? A ball python was next، and while its skeleton was no surprise، that didn’t make it any less interesting. Did anyone else presume a beaver’s tail was devoid of bones? And last but certainly not least، the Toco Toucan – stripped of its wondrous colours on the beak، it looks positively prehistoric. 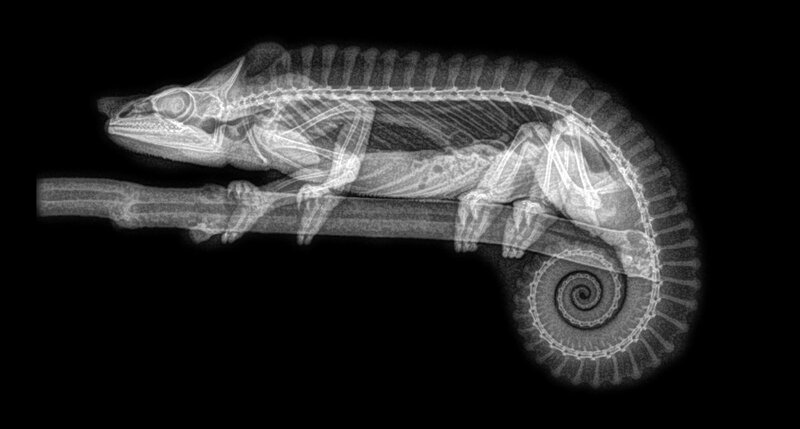 And while all five X-ray images produced intrigue، there was one clear winner: the chameleon. You can’t camouflage yourself on an X-ray، buddy. We see you.